Magda Brown is from Miskolc, Hungary. In 1944, when she was 17 years old, she was deported on one of the final transports to Auschwitz-Birkenau with her entire family. 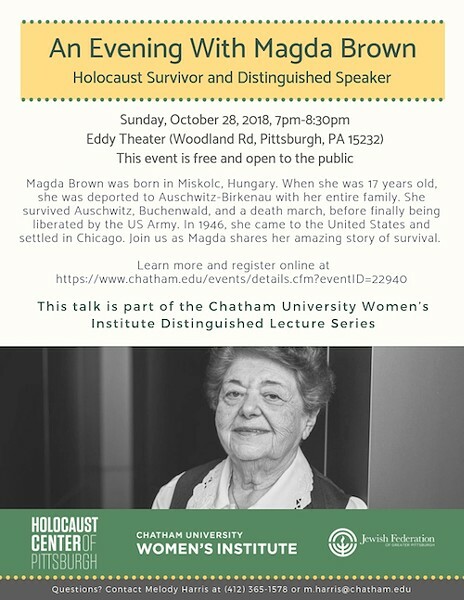 Visiting from Chicago, Illinois, on October 28 Magda will share her harrowing story of survival. This event is free and open to the public, and is being presented in partnership with Chatham University as part of their Women’s Institute Distinguished Speaker Series.